The two Texans running for president could not be further apart on how they are responding to the cacophonous candidacy of billionaire businessman Donald Trump. Editor's note: This story was updated on July 22. Former Gov. Rick Perry's war of words with Donald Trump is adding a new chapter to his in-state rivalry with U.S. Sen. Ted Cruz, who has refused to denounce the billionaire businessman for a string of incendiary comments that have riled the presidential contest. 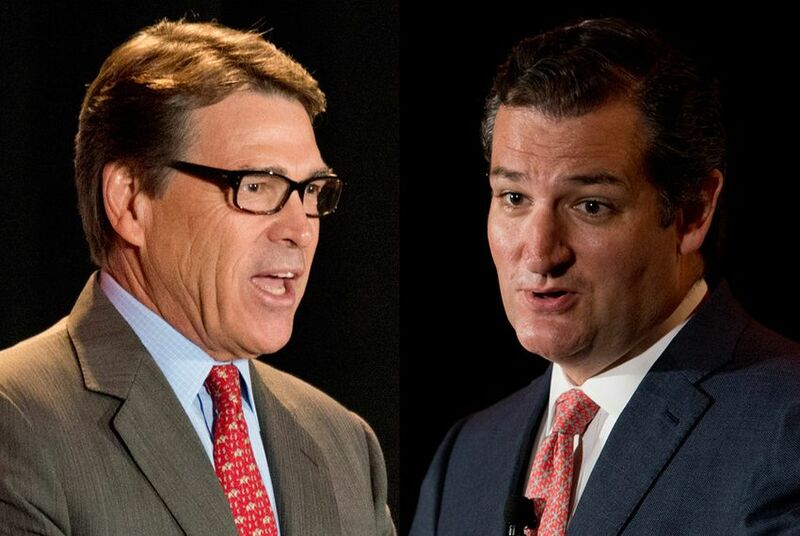 Perhaps no development in the 2016 race has found Cruz and Perry further apart than the cacophonous candidacy of Trump, who has left both Texans in his dust while shooting to the top of polls with just over two weeks to go until the first GOP debate. Putting him at odds with just about every other Republican hopeful, Cruz has refused to directly criticize the real estate magnate over his recent statements, including characterizing people living in the country illegally as rapists and suggesting that U.S. Sen. John McCain, R-Ariz., is not a true war hero because he was captured. Perry, meanwhile, has aggressively positioned himself as the leading Republican critic of Trump, an unmistakable contrast with Cruz that some backers of the former governor are happy to highlight. Perry is expected to keep up the drumbeat of Trump criticism with a speech Wednesday in Washington, D.C. In his remarks, Perry plans to cast Trump as a destructive force within the GOP, ultimately threatening its chances at winning back the White House in 2016. "He offers a barking carnival act that can be best described as Trumpism: a toxic mix of demagoguery, mean-spiritedness and nonsense that will lead the Republican Party to perdition if pursued," Perry will say, according to excerpts. "Let no one be mistaken: Donald Trump’s candidacy is a cancer on conservatism, and it must be clearly diagnosed, excised and discarded." Don't expect Cruz to take anything close to that tone the next time he weighs in on Trump. Given ample opportunities to distance himself from the bombastic billionaire, Cruz has repeatedly lauded Trump as a straight talker and has resisted engaging in what he has deemed "Republican-on-Republican violence." "If there's a strategy of being respectful, then we've been equally respectful of all the candidates," Cruz spokesman Rick Tyler said Tuesday. To some political observers, the contrast has nonetheless affirmed the different kinds of campaigns each Texan is trying to run: Perry as the seasoned leader aching for a second look ahead of a critical first debate, and Cruz as the conservative warrior mindful of his right flank, where Trump appears to be drawing some support. Cruz has certainly not avoided commenting on Trump's controversial statements. On illegal immigration, Cruz said Trump was bringing attention to an important issue, even if his rhetoric was a bit over the top. On McCain, a former Navy pilot who was captured during the Vietnam War, Cruz left no doubt that he views his Senate colleague as a war hero. But he has been careful to leave Trump-bashing out of his replies. Cruz "tactically is sticking to something that will benefit him over the long term, which is not dog-piling on every other candidate," said Ted Delisi, a Republican strategist who worked on Perry's 2012 presidential campaign and is now unaffiliated. "Trump is tapping into some anti-establishment support that Cruz feels like ultimately will be in his camp." Tyler denied Tuesday that the senator was trying to thread the needle and angle for Trump's backers in the long run. "It's as valid of a point as it would apply to Gov. Perry's supporters, Sen. [Lindsey] Graham's supporters, Gov. [Jeb] Bush's supporters — let's just go down the list," Tyler said, adding that the only strategy at play is Cruz's commitment to civility toward other Republicans. There is likely no love lost between Cruz and Perry, who publicly praise each other but remain natural rivals as the two best-known Republicans from Texas. More recently, Perry has been taking more shots at Cruz than Cruz has at Perry, urging early-state voters to beware of electing another "young United States senator" to the highest office in the land. Their polarized approaches to Trump have not led to any direct clashes, though the two seem well aware they are not seeing eye-to-eye. Cruz chuckled in a recent interview when reminded that Perry has called on Trump to "immediately withdraw" from the race. In another recent interview, Perry hardly contained a smirk while answering a question about Cruz's decision to meet with Trump at his eponymous tower in New York amid the controversy over his remarks on illegal immigration. "Well, everybody gets to pick who they hang out with, so I have no idea what's going on," Perry said in the interview with CNN. Johnson called Trump's campaign a "character test" of who in the GOP field will "stand up to a pro-choice, single-payer, do-not-love-your-neighbor-as-yourself Republican." He was referring to some of Trump's liberal stands over the years, which Bob Haus, Perry's top Iowa strategist, was quick to point out when the billionaire began going after Perry. Perry "attacked by pro-choice, pro-universal health care Hillary donor. Who? Hillary's best surrogate, Donald Trump," Haus tweeted earlier this month. But even on that line of attack, Cruz has so far taken a pass. Ray Nash, a former sheriff who co-chairs Cruz's campaign in South Carolina, said he "absolutely" believes Cruz has the "right response" on Trump. Trump may be rough around the edges, but his candor is refreshing, Nash added. "My personal opinion is that Donald Trump is just a straight talker, and he's not politically correct, doesn't try to be politically correct," Nash said. "I think it's very much needed in today's political arena. Political correctness is what has gotten us into this mess we're in." Cruz appears to be picking up on his supporters' affinity for Trump's tell-it-like-it-is style. Cruz recently amended his stump speech to include a reference to how he defended Trump when no other Republicans would. "Donald spoke out, and then this parade of Republicans ran out to smack him with a stick, one after the other after the other," Cruz said Friday in Iowa, according to RealClearPolitics. "The only one that didn’t was me."